Learning how to keep squirrels out of the garden is something every gardener needs to do. While squirrels can be fun to watch, they also eat a great deal and can destroy plants quickly by simply scurrying through the garden. Rather than clean up after them, learn how to keep them out of your garden. Squirrels can harm your garden and several ways so lerning to keep these annoying creatures out of your garden is important. Squirrels damage bulbs by digging them up. These furry little creatures also take down bird feeders and will dig up plants including your vegetables. Some will tear bark off trees, leading to disease. To prevent garden related squirrel problems, follow these tips. At the start of the planting season, lay plastic mesh over the areas where you will plant flowers and other plants. This works as a deterrent for squirrels since it hurts to dig in this area. Plant hot peppers in soil beds where squirrels are digging. The hot peppers will not harm the soil or plants but it leads to a slight burning sensation on the squirrel's feet, which will stop it from digging. This is ideal for a garden already affected. Make a garlic spray to spray on vegetables and plants to stop squirrels from entering. Cook several cloves of garlic in a pan of water for several minutes to allow the garlic to infuse into the water. Once cool, add to a spray bottle and spray a small amount on your plants. Use motion-sensor sprinklers in the early morning and late evening hours when squirrels are most likely to feast on your vegetables. If these sprinklers are sensitive enough, they will come on just as the squirrel enters the area. Eventually, they will stop visiting. These methods of keeping squirrels out are great for situations when you know there is a pest. However, prevention is often the best tool to stop squirrels from destroying your garden. Squirrels enjoy running along wiring and the tops of fences. They are most comfortable in trees. When trees have branches close to branches of other trees, this makes an easy way for squirrels to get from place to place without having to drop to the ground where predators are. Rather, squirrels jump from limb to limb, having access to any area they wish. The first tool of prevention, then, is to minimize the ease of getting into your garden from tree limbs. If you have a vegetable garden, ensure no tree branches are hanging over it. Trim away branches that are several feet from the garden. This will also improve sunlight to the garden. Keep in mind that any structure near a garden offers an opportunity for squirrels to climb in, including your home. 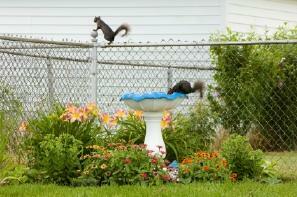 If possible, keep the garden away from the home or any structure squirrels can climb up on and into the garden. Also, keep in mind the importance of using the right type of fencing for animals like squirrels. Not all fencing works for these pests since they can squeeze through most holes and climb right over the top. If you are having a significant problem with squirrels, and you hope to use fencing as a solution, follow these tips. Ensure the entire outside parameter of the garden is fenced in well. Select the smallest diameter of holes possible in the fencing. Use plastic fencing or mesh wire fencing that squirrels cannot climb onto because it hurst their paws. Do not forget the top. Depending on the size of the garden, you may wish to create a makeshift mesh lid for the garden that you can put on and take off when you need to be in it. This is not simple and it can be an expensive solution. Learning how to keep squirrels out of the garden is not an easy task and in some cases, it can be futile. Nevertheless, by using a few of these tricks, you will see fewer squirrels invading your garden.